Some of the plant compounds in lemon have been shown to potentially aid with weight loss. But the main objective of infused waters is to make the water taste great so you drink more of it. Getting the proper amount of water each day is essential for weight loss! Hello. I’m a fan of cucumber,ginger and lemon water cos it help in my weight loss. I love it. I’m glad you are enjoying it Atim! Can I boil my cucumber lemon ginger juice??? I wouldn’t recommend boiling the water because some of the nutrients may be degraded by heat. Do you have to follow a certain diet with this detox drink? The healthier your diet the better, but if your diet isn’t as healthy as you’d like yet, then making infused waters to help you get enough water each day is a great place to start! This sounds good, I will give it a go my first time infusing. That’s great Linda, let me know what you think! This is still one of my all time favorite flavors for infused water, it’s just so refreshing! Yes this water is great for a flat tummy because it helps to keep you properly hydrated! When your body isn’t regularly getting enough water it will hold onto excess water which is what we call “water weight”. Hi Kailey, I just started to make this and have a question or 2. When blended in the pitcher and you pour into glass, do you also pour the lemon, cucumber, etc. into the glass and eat it? Also, does this promote weight loss? This is the primary reason for me trying it! I ate the cucumber and it was yummy! Not a big fan of the ginger or lemon, but gotta say, this drink is awesome and can drink daily. Thank you for your time & have a great day. I do also pour the lemon, cucumber, etc. into my glass but I also like to leave a good amount in the pitcher to keep infusing. I can continue to refill one pitcher for 2-3 days and the flavor will still be good if there’s enough ingredients still in the pitcher! After that I usually dump it and make another batch because everything is starting to get soggy. I typically don’t eat any ingredients after I drink my infused waters but you there is nothing wrong with doing that, it will actually get you even more nutrients than what has soaked into the water! 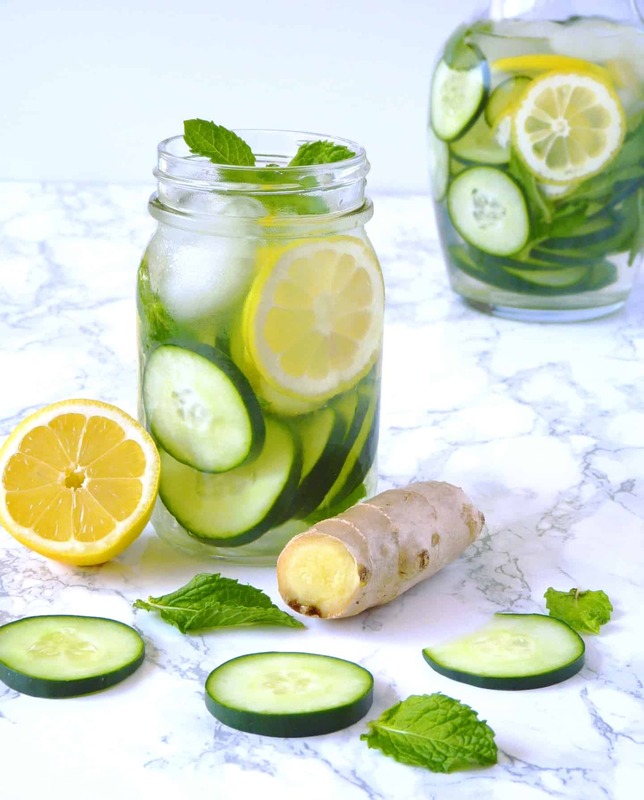 Infused waters are great for weight loss because they are a delicious way to stay hydrated without any added sugar or calories like other flavored drinks. Proper hydration (8+ cups of water per day) actually helps you lose water weight as well. When your body is dehydrated it can hold onto up to 4 lbs of excess water which can make you feel bloated. There is also studies showing that being properly hydrated can boost your metabolism/resting calorie burn rate (source).